I’m not a health professional, but it’s likely because you ate foods that were too high on the glycemic index. The Daniel Fast is a very healthy way to eat and I receive countless messages from men and women with diabetes who are able to totally balance their BS levels by eating a balanced Daniel Fast plan. I suggest you minimize fruits with higher amounts of natural sugar and instead concentrate on whole grain meals, hearty salads, beans and rice and other legume dishes. Be blessed on the Daniel Fast. Thanks so much, I will purchase it this week end! Also, a favorite prepared dressing that fits the Daniel Fast is Newman’s Own Oil and Vinegar Salad Dressing. I’ve done the Daniel fast in the past and will start on 01/09/11. I have a question about salad dressings. I really love salads and would like to continue eating them while fasting. I can’t find any dressings without additives or preservatives. When I’ve tried to make my own dressing, it has been a disaster. I love the vinaigrettes, but also like a few drizzles of poppy seed. Please help! I receive countless message from men and women with diabetes who are able to control their blood sugar levels by eating a balanced Daniel Fast diet. Meals that center on whole grains, fruits and vegetables treat the body well and you most likely will find that you can reduce or eliminate medications while on the fast. With that said, you will want to monitor your BS levels and if you sense the need to modify the Daniel Fast eating plan, then that would be totally acceptable. However, even if you do modify it, you will want to stay within appropriate boundaries rather than satisfying the flesh for cravings. Is there a version of this fast that is safe for a diabetic? This is my frist time doing the Daniel Fast. This is day 16 for me and I feel great. I have been getting up early in the moring to spend time with our Father and it has been wonderful. I can hear Him more clearly at that time. I want to thank you for all that you do to help us while we are on the fast. The info, scriptures and prayers. You have been a blessing. Love you my sister in CHRIST 🙂 I am praying for you also. Yes, by all means you can use salt, pepper and all other pure spices and seasonings. I’m not sure where you got the information that salt and pepper are not allowed on the Daniel Fast, but I do know there is a lot of MISinformation out there. 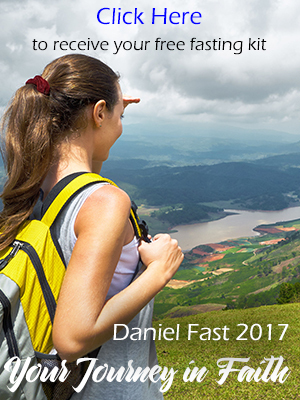 I have been researching the Daniel Fast for many years and I encourage you to go to the http://www.Daniel-Fast.com to receive a copy of the Daniel Fast Guidelines. Fasting should never bring harm to the body . . . so please be sure to follow the Daniel Fast Guidelines that are based on the fasting practices of the prophet and typical Jewish fasting principles. I went on the Daniel Fast last year and we used no salt and pepper. I got sick with cramps. The doctor said it was due to no salt in my body or something. My church is going on it again this year and I would love to go but don’t want the doctor bill! Can I use salt on the fast or not? please help me. Actually, if they are organic olives the citric acid is most likely “naturally derived.” That means that it’s not a man-made chemical and would be allowed on the Daniel Fast. Be blessed on the fast and my prayer is that you will learn more about seeing the Lord as your First Love, your Provider and your Father. He loves you so much and will be there for you always. He is closer and more loving than any earthly person. He is always calling us to trust in Him more and to enjoy the rest that depending on Him gives. I was reading the label on organic olives. One of the ingredients is citric acid, which is a natural preservative. My guess is, it is not permitted for the Daniel Fast. I’m am going in a new direction in life, starting out on my own at 50. My Lord says that if I acknowledge Him, He will direct my path. I will begin the Daniel Fast in a few days. I am delighted that you asked this question again as it will help others! Lots of natural foods contain sugar in them. So those are fine on the Daniel Fast (although it’s still wise to limit them, especially if you need to watch your blood sugar for health or weight loss reasons). But what is NOT allowed on the Daniel Fast is when sugar has been added by the food manufacturer. When people start reading the labels about the foods, they are stunned at the amount of sweeteners and chemicals added to foods. It’s a real wake-up call! So, keep you eyes out for sugar or sweeteners in the list of “ingredients” on the label. I usually make my own soups, but I occasionally buy the boxed variety that you can find in the natural foods section of most supermarkets. However, you will need to read those labels, because sweeteners are often added (cane juice is sugar in a different form). I may have asked you this before, but I can’t remember. If so, please forgive my repeating myself. If sugar is not listed in the Ingrediants but is listed under the Nutrition Facts, what does that mean exactly? Even though I know it is way better to make everything from scratch, sometimes that is just not possible. Is there a brand of soup out there that you know about that is Daniel Fast friendly when you’re in a crunch and haven’t been able to make homemade? Thanks for all you continue to do! I love what you guys are doing! Keep it up! Thanks so much for catching my mathematical mistake! I fixed it on the post. And you are correct, there is natural MSG. However that which the Johns Hopkins article is commenting on is that extra that is added to so much processed food. If we ate 1 Million Pounds, and it increased 300 Percent, that would equal 3 Million pounds… if the numbers are correct, that is. Also, Monosodium Glutamate is naturally occurring in most ALL savory foods. The foods having the most of this being Meat (mainly Red Meat) But it is Found in many other things as well.